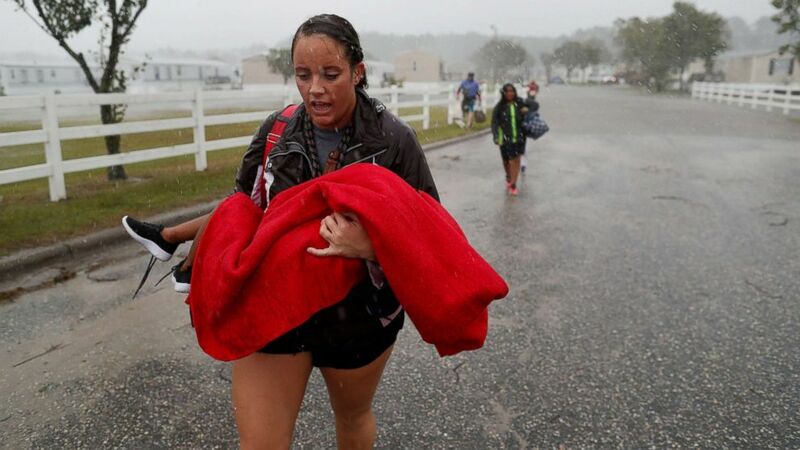 10,000 people are in shelters in NC and over 4,000 people have been rescued. 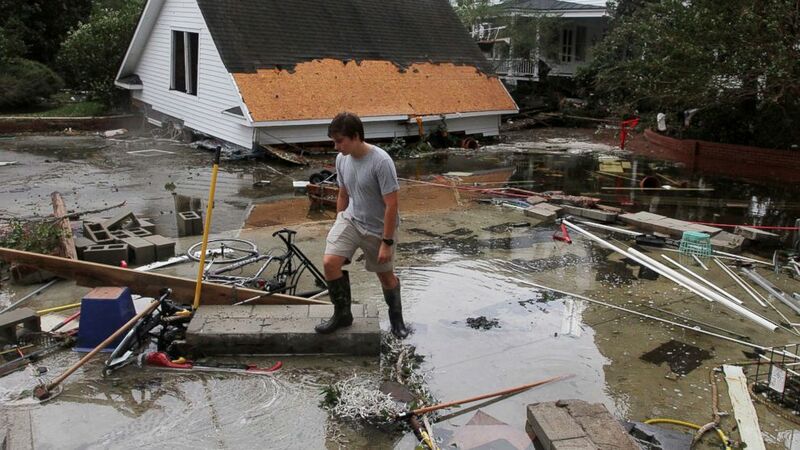 North Carolina's governor on Tuesday pleaded with residents to remain in shelters until flooding from Florence recedes. "I know it was hard to leave home, and it's even harder to wait and wonder whether you have a home to go back to," Gov. Roy Cooper said at a news conference. "But please, for your safety ... do not try to return home yet." Roads remain dangerous and creeks and rivers continue to rise, he added. About 10,000 people are still in shelters and over 4,000 people have been rescued since the deadly storm made landfall on Friday. 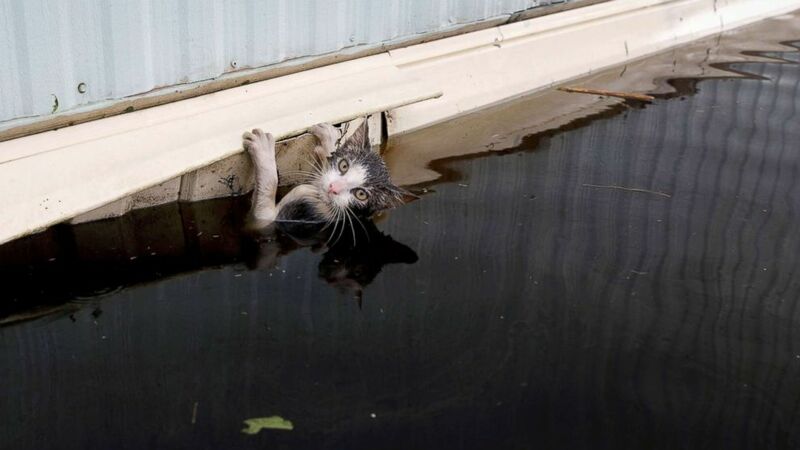 (Jonathan Drake/Reuters) A cat clings to the side of a trailer in the flood waters before it was saved as the Northeast Cape Fear River overflowed its banks in the aftermath Hurricane Florence in Burgaw, N.C., Sept. 17, 2018. (Randall Hill/Reuters) During a driving rain, Maggie Belgie of The Cajun Navy carries a child evacuating a flooding trailer community during Hurricane Florence in Lumberton, N.C., Sept. 15, 2018. In North Carolina, more than 1,000 roads remain closed, drenched by the powerful storm. In South Carolina, one bridge was so weak that it gave out under a semi-truck Monday. 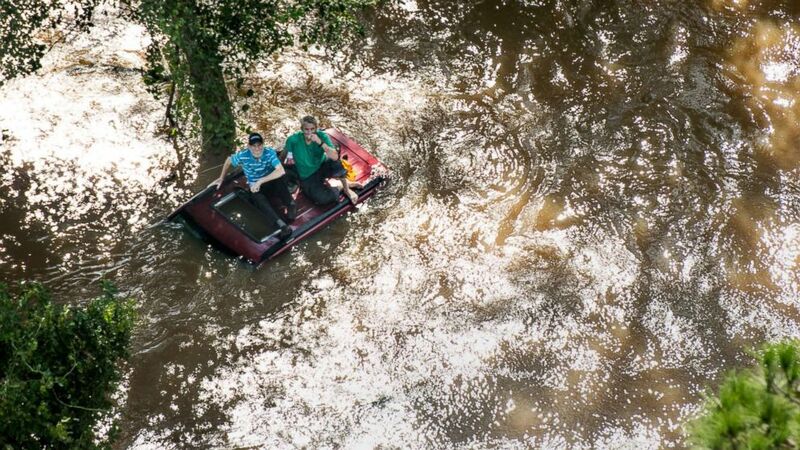 (Sean Rayford/Getty Images) Two people sit on the roof of a vehicle trapped in floodwaters from Hurricane Florence, Sept. 17, 2018 in Wallace, S.C.
(David Goldman/AP) Members of the North Carolina Task Force urban search and rescue team wade through a flooded neighborhood looking for residents who stayed behind as Hurricane Florence continues to dump heavy rain in Fayetteville, N.C., Sept. 16, 2018. Getting food to people stranded by rising waters is also a problem. "We have no way of getting food for ourselves or the animals," one trapped resident told ABC News. "Power is not gonna come back for awhile. Our road is washed out." 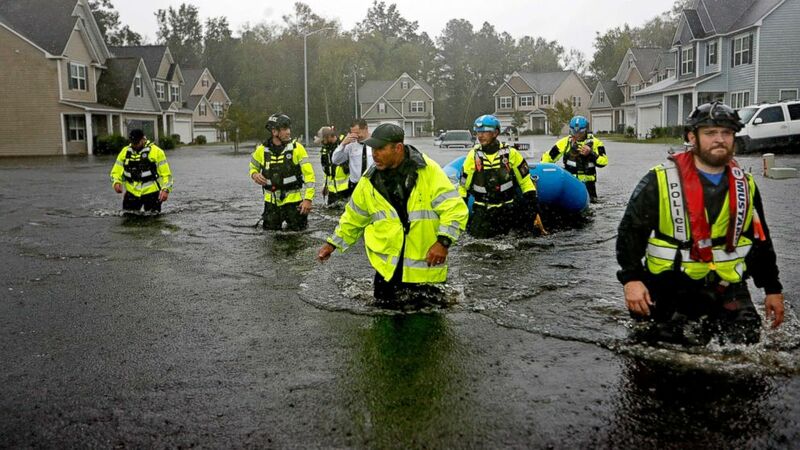 On Tuesday, officials in Wilmington distributed goods including food, water and tarps to residents who lined up in cars and on foot. Among those in line were Robert and Karen Foster, whose ceiling collapsed during the storm. The couple has already lived through hurricanes Floyd and Matthew. "Everybody's closed, so we're hoping we can at least get a tarp here, maybe two," Karen Foster said. "This has been the absolute worst one," she added. "And it's because it just sat over us for so long and dropped so much water." 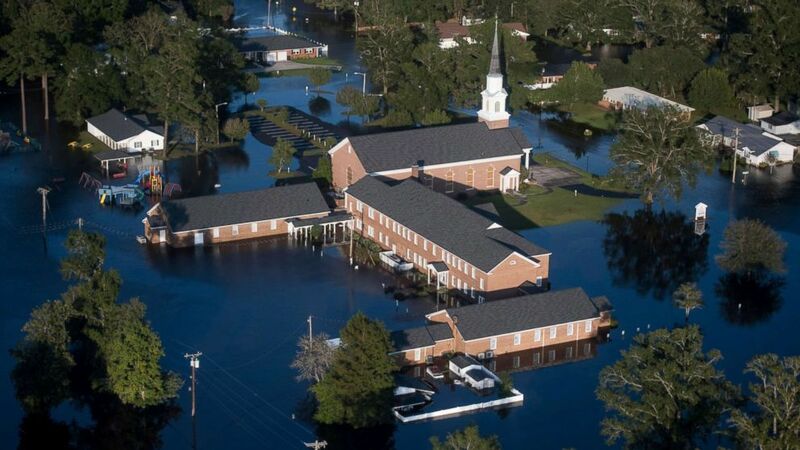 (Sean Rayford/AP) Floodwaters inundate a church in Conway, S.C., after Hurricane Florence struck the Carolinas, Sept. 17, 2018. Four mass feeding kitchens are operating across the state, and more are expected to be established, officials said Tuesday. More crews are now assigned to debris removal and some ports will be open Wednesday for ferries to deliver needed supplies, officials added. 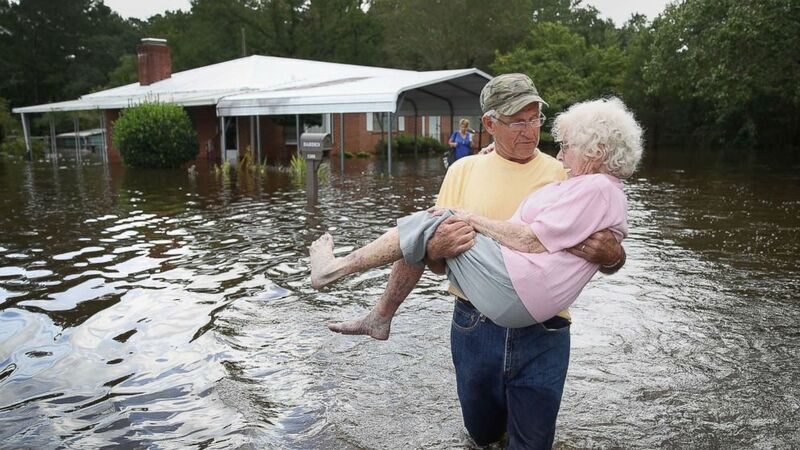 (Joe Raedle/Getty Images) Bob Richling carries Iris Darden as water from the Little River starts to seep into her home, Sept. 17, 2018 in Spring Lake, N.C.
At least 32 people are dead, including several young children, as a result of the storm, which brought unprecedented rainfall and flooding to the Carolinas. Florence dropped about 8.04 trillion gallons of rain on North Carolina, the National Weather Service said Tuesday, citing "the unofficial, radar-estimated storm total rainfall." Rainfall totals in North Carolina and South Carolina have set new records from a tropical cyclone, with 35 inches and 23 inches respectively. (Gray Whitley/Sun Journal via AP) Joseph Eudi looks at flood debris and storm damage from Hurricane Florence at a home on East Front Street in New Bern, N.C., Sept. 15, 2018. ABC News' Marissa Parra contributed to this report.